As a Dutch intern on Curaçao, it can be hard to keep up to date with what is going on at home with friends and family. If it hadn’t had been for a spontaneous Skype session with my youngest sister (I am a brother to four sisters) last week, I probably would have had no idea that she is going to be on stage this weekend, performing in a play for friends and family. It’s not just humans who get up on stage to perform. On a regular basis there are wonderful performances to enjoy in the animal kingdom too. Nature can easily satisfy many theater enthusiasts, as long as they know where to look. See, animal theater doesn’t require a ticket, you don’t have to check in your coat and no one tells you which seat is yours. Those who want to sit in first row for a performance in nature had better carefully note down the different mating seasons on their calendar. Humans might prefer to keep such business behind closed doors, but in nature, that’s when the metaphorical spotlights come on. Mating behavior is often combined with a lot of drama. 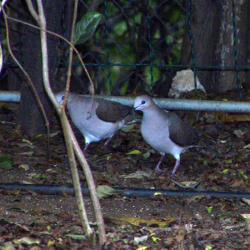 A beautiful example is the Verreaux Dove – Ala Duru in Papiamento. When the mating season arrives, the male dove likes to widen his collar of feathers to an impressive size and bend his legs until he is close to the ground. Now that he has assumed the proper position, it is time to dance. And not just your run of the mill side step and head bump, oh no. In high pace he dances in circles around the female of his choice. Usually, at first, the female doesn’t seem all that impressed, but when her admirer has proven himself to be a skillful enough dancer, she too cannot resist the rhythm. Together they complete the dance by pressing their upper bodies against one another, before flying off to do that which humans usually prefer to keep private. 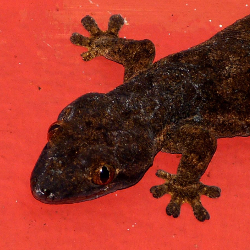 Another good example are the love rituals of the Pega pega grandi, a type of gecko with a characteristic, triangular shaped head, that one usually finds sitting on the wall. When this reptile is in the mood for some reproduction action, it produces a fast clicking sound, right before chasing the females in frightening speeds. That clicking sound is not only to attract a partner, but also to inform other males in the area of their intentions. It might happen that two males end up disagreeing on who gets to go first, which in turn can lead to some unfriendliness. In a battle of such nature, one of the battling geckos might plummet to the earth, falling down from a wall or the ceiling, only to immediately continue the chase for female beauty. The Pega Pega Grandi, with its characteristic triangular shaped head. From the examples above, I’m sure you have understood that animal theater usually takes place from a practical point of view, but that doesn’t make it any less entertaining. For human spectators that is, for I can only attempt to imagine the stress of animal actors. In nature, even with theater, the stakes are pretty high, considering that the entire love life of the actor is at risk and such its reproductive success. Luckily for humans, human theater is merely a form of entertainment. Sure it might bring out some nerves and insecurities for those on stage, but usually no more than that. And so I urge my sister to relax and enjoy this weekend, when she is up there for friends and family. And because I cannot attend due to obvious reasons, I will use this opportunity to say: little sister, good luck! Interessant artikel en leuk geschreven!